Clean your most expensive screens with confidence. Now you can take it anywhere with our new individual packs. Gentle formula cleans LCD screens on TVs, laptops, MP3 players and cell phones, as well as plasma screens. Cleans fingerprints, oils and greases, residues, dust and smoke film. 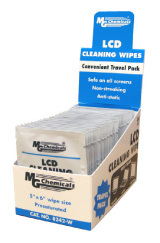 The special wipes will not leave lint or streak and will not drip. The resulting antistatic barrier repels dust. Also effective for cleaning telephones, keyboards, peripherals, or desktops.